Britain opposes the death penalty. In its annual update on human rights and democracy around the world published last week, the Foreign Office said: "It is the long-standing policy of the UK to oppose the death penalty in all circumstances as a matter of principle." It added: "The FCO continues to raise concerns over the use of the death penalty in the US." Only according to the Home Secretary, Sajid Javid, it does not. His letter to the US Attorney General, leaked to the Daily Telegraph, makes clear that the UK is not seeking any assurances from the Americans that two captured jihadi fighters of British origin will not face the death penalty if they are tried in the US. This has now been confirmed on the floor of the House of Commons. Not surprisingly this has provoked a strong backlash. Labour and the Lib Dems have issued statements accusing the home secretary of undermining human rights. Amnesty International accused him of hypocrisy. And even Downing Street has been cautious, saying the prime minister had been aware of the decision but the spokesman refused to go so far as to say that she actually approved of it. So why might Mr Javid take this decision, in apparent breach of long-standing British policy? He says in his letter he has "strong reasons" for not seeking any assurances. He does not say what these reasons are. But he suggests that this case is "distinct" because the two fighters of British origin - part of the so-called "Beatles group" - are accused of kidnapping and murdering UK and US citizens, how they are treated will be an example to others, and there is a need to deliver justice to their victims' relatives. But none of this explains why Mr Javid might want to risk the political backlash that will follow any decision to weaken Britain's opposition to the death penalty. Perhaps the real motivation is the government's desperation to avoid having to try these two men in Britain. They are currently being held in northern Syria by the Syrian Democratic Forces. They have been stripped of their UK nationality. Where should the IS 'Beatles' be tried? Cases like these are extremely difficult to prosecute because of the difficulty in obtaining evidence, finding witnesses and establishing what crimes have been committed in which jurisdiction. And in his letter, Mr Javid argues that a more successful prosecution is more likely in the US where laws are different to the UK. 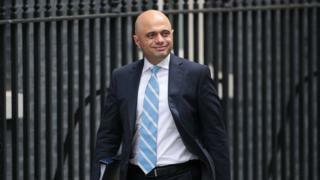 What ministers and MPs believe is that Mr Javid is attempting to smooth the way for the Americans to take the cases by letting them know that the UK will not, for once, kick up a fuss about the death penalty. In other words, this is all part of a deal. And some sources suggest this is a deal with precedent, that this is not the first time the UK has turned a blind eye towards its death penalty policy. The Security Minister, Ben Wallace, told MPs that it had happened before but not while he has been in his job. He explained that little-known guidance to ministers, known as the Overseas Security and Justice Assistance guidance, that was last updated January 2017, allowed the Home Secretary to make an exception to the rule. It states "written assurances should be sought before agreeing to the provision of assistance that anyone found guilty would not face the death penalty" but "where no assurances are forthcoming or where there are strong reasons not to seek assurances, the case should automatically be deemed 'High Risk' and FCO Ministers should be consulted to determine whether, given the specific circumstances of the case, we should nevertheless provide assistance". This has not assuaged the concerns that have come from many quarters. MPs from all sides of the House have expressed their worries. Is UK policy on the death penalty really decided by home secretaries on a case by case basis? Was this policy change agreed by the cabinet or agreed solely by Mr Javid and the former Foreign Secretary, Boris Johnson? Has the government thought through the consequences for the 62 British nationals detained worldwide for charges that could attract the death penalty? And what impact might it have on the UK's foreign policy next time it chastises other foreign powers such as China, Saudi Arabia and Pakistan for their own use of capital punishment? Does so-called "global Britain" believe in promoting human rights or only when it serves its purpose? The truth is that it appears a corner is being cut in a hard case. The desire to ensure that some allegedly evil individuals are prosecuted in the United States for some particularly brutal crimes is outweighing the need to preserve the purity of Britain's opposition to the death penalty. There will be some who do not mind this, who believe that this is a risk worth taking with individuals of this nature. But there are others, including within government, who are wondering if this is just the wrong thing to do and there will be consequences down the line.